Cotton Swabs and Our Ears – A Match Made in Heaven? Back in high school, a teacher of mine took a leave of absence over the course of a few days, and when he returned, came back with a full vengeance and preached about the dangerous use of cotton swabs in our ears. He had to get a surgery as a result of using cotton swabs for decades, which caused a damaging build up of gunk and wax within his ear that needed to be removed. Although this happened many years ago, I still use cotton swabs today in order to clean out my ears, and the idea of going a period of time without giving them a good cleaning turns me squeamish. So the questions I am proposing today is whether or not cotton swabs actually cause ear damage, and whether or not I should continue my use of them in the pursuit of a healthier life? First though, lets take a closer look in our ears, shall we? Earwax, according to the American Academy of Otolaryngology, is a healthy substance that accumulates within the ear with the purpose of… cleaning and protecting our ears. So if our bodies already create a cleaning solution for my ears, why heck am I spending my hard earned money on cotton swabs?! I could have treated my ears to something nice, like a sweet pair of Ear Buddies! However, according to the AAoO, a build up of wax can actually lead to a number of bad things, such as earaches, hearing loss, and tinnitus, so cleaning them is actually useful if there is a build up of too much ear wax. So, cleaning our ears is really important under the right circumstances, and besides, millions of people have been, and still are, using cotton swabs to clean their ears, ever since the early 1900s, which is why my questions remain to be answered – do cotton swabs cause ear damage and should I ever use cotton swabs again to clean my ears? Direct Cause: Using cotton swabs causes ear damage. Reverse Cause: The ear damage is causing the use of cotton swabs. Third Variable Cause: Another force or object is causing the ear damage, as opposed to just the interaction of the cotton swabs. 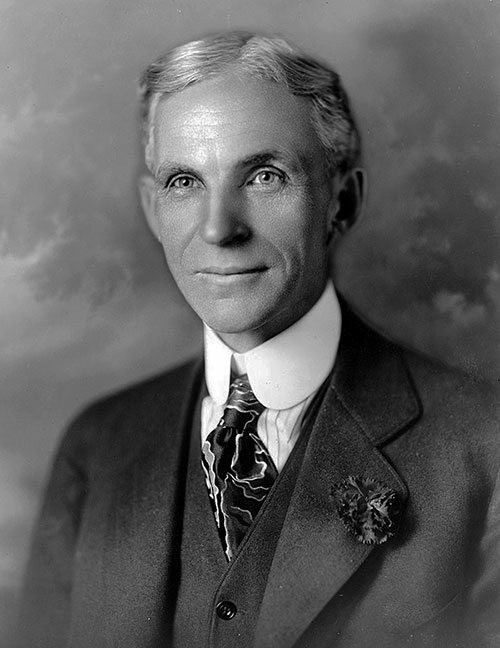 Chance: Anything is susceptible to chance, and thus it cannot be ruled out. We can already rule out the Reverse Causation, since last time I had any kind of ear damage, my first instinct was not to run for a cotton swab and just start prodding and poking around within my ear. Plus, it is not like my ear can communicate directly with the cotton swabs themselves to come and assist it right away. That would be pretty neat though if my ear had that kind of power. First, we will tackle the Direct Cause which is that cotton swabs themselves cause ear damage. According to a 2011 study published and funded by the Henry Ford Hospital, cases of ruptured eardrums (or ear damage) and the number of patients who use cotton swabs regularly for cleaning, correlate quite well with one another. When stretched too far into the ear itself, cotton swabs have been found to cause damage within the ears of patients. This study also found that this damage tends to heal quickly over the course of a few weeks at most, and required little to no medical procedures to help repair the ear. The American Academy of Otolaryngology also discuss methods of removing earwax, and mention that cotton swabs should not be used because, in most cases, the wax is just shoved further into the ear. Instead of clearing up the blockage, the blockage is actually being reinforced by our efforts to swab it out, which helped to cause ear damage! So, claiming that a Direct Cause exists between cotton swab usage and ear damage is not far off by any means and cannot be ruled out. What about a Third Variable Cause, such as pressure to use these cotton swabs by other sources, such as doctors, advertisements, etc. Well, according to a survey taken by the Journal of the Royal Society of Medicine, 171 of the 325 patients, or 51% of patients, visiting an ear, nose, and throat specialist reported using cotton swabs. When the patients who used cotton swabs were asked why they did, shockingly enough, a majority of patients responded simply by stating that it seemed like a good idea, or that they use them because loved ones use them – but offer no more context than that. Use of the cotton swabs themselves were not due to an official recommendation from a doctor or nurse, but rather just because it felt right, and that is it. As a result, the scientists behind the study called for better warnings on cotton swab packages to better inform consumers of the dangers behind incorrect use. Individuals may also have a more difficult time affording other variations of treatment for a build up of ear wax as well if they are strapped for cash, leading them to follow the lifelong tradition of the generations before them and just settle for the all purpose cotton swabs to get the job done. According to CostHelper Inc., the average medical treatment without insurance can cost someone $100 or more. Not everybody has proper medical coverage in America, and as a result, the difference between spending a few bucks and a few seconds every morning cleaning your ears for a few months at a clip begins to seem like a much better alternative to taking a half, or even full, day off of work and spending upwards of a few hundred dollars in expenses that could have gone towards food or other necessary bills. These results lead to the fact that Third Variables could be playing a part in ear damage as well. There is a Chance that all of this is just wrong, and that cotton swabs either do not cause damage or actually prevent damage to the ear itself through prolonged use. 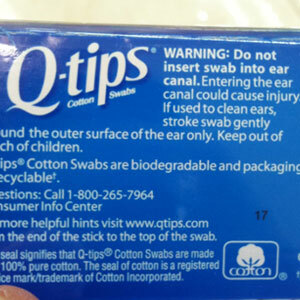 However, this Chance seems rather slim, if not virtually non-existent, in my opinion, due to the alarming number of research and survey articles out there about the dangers of using cotton swabs within our ears, as well as the number of warning labels placed on just about every brand of cotton swabs currently on the market. Now it is time to review my findings! To repeat, the questions were whether or not cotton swabs cause ear damage, and whether or not I should stop my use of cotton swabs to clean my ears. Due to not only my findings through direct, third variable, and even the causation of chance, I concluded that using cotton swabs to clean your ears can cause ear damage, especially over the course of years which could lead to a dangerous build up of earwax, which is exactly what happened with my teacher back in high school. But is the evidence truly compelling enough to get me to stop cleaning my ears with these dastardly weapons? Absolutely! Thinking back on Andrew’s advice back in class, the evidence I have gathered definitely swayed my opinion on the effects using cotton swabs in my ears could have on my health, both in the short and long term. Not only will I try to explore some safer, alternative methods of removing a large build up of wax, such as a light suction tool or the use of certain oils to help break it down, but I will also share my findings with family members and friends who have been using cotton swabs for their entire lives as well. Thanks again for your time, and I hope you learned something new! Did you enjoy my post? Have any comments, questions, or concerns? Feel free to leave a reply! This entry was posted in Uncategorized on October 11, 2016 by Sean Kyle Reilly. Your blog was extremely thorough and interesting! As someone who gets ear infections a lot and has permanent hearing damage in one ear, this caught my attention. Anything that I can do to prevent more damage to my ears, I will do! Your evidence is compelling and your argument is well thought out and cohesive. You did an excellent job including material from class to aid your blog. While your blog convinced me to no longer use cotton swabs to clean my ears, I will surely still use them for other purposes, such as applying/removing make-up. On a funnier note, let us not forget the most iconic character on Zoey 101 and her love of cotton swabs https://www.youtube.com/watch?v=XpPkAKIXBx8. This article saddens me. I use cotton swabs to clean my ears like once a week, after reading this I’m slightly scared to continue this routine. I’m pretty sure that feeling will fade and I will continue, but I’m definitely going to look into this issue more…maybe i can find a better alternative method. Whats up Sean. Your blog was amazing and laid out perfectly. I happen to use cotton swabs weekly to cleans my ears; however, I use these tools very gently to avoid ear damage. The reason i use these tools is because its what i have been given and used all my life. I agree with all of your points and find your data to be fascinating, but i don’t think its compelling enough to make me stop my routine cleansing. I will be more careful when cleansing my ears with these tools in the future though. 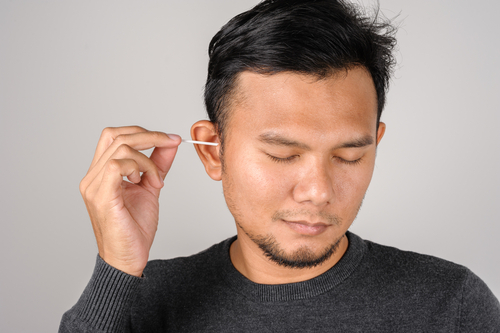 If you ever feel like you are not cleaning your ears right or feel like you could be damaging your ears check out this article to make sure you’re not making the same mistakes your teacher did!